H&rcaron;ensko is situated at an elevation of 115 m at the confluence of the Kamenice into the river Labe (Elbe) in the D&ecaron;&ccaron;ín district of northern Bohemia. The municipality has a population of 280 (2014). Herrnskretschen was first mentioned in 1475, the Czech name in 1623 (in the historic version Hr&zcaron;ensko together with the German historic Hernskrec&zcaron;em). Since the Thirty Years' War (1618–1648) the domains were in possession of the Clary-Aldringen family (1627 Bohemian barons, later counts, 1767 princes of the Holy Roman Empire). 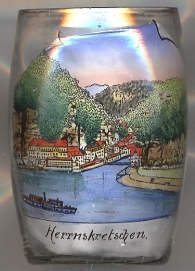 In the second half of the 19th century, H&rcaron;ensko became a popular resort town, especially due to its vicinity to the &Ccaron;eské Švýcarsko (Bohemian Switzerland) region with its natural monuments such as Edmund's gorge (Edmundova sout&ecaron;ska) or the sandstone arch Prav&ccaron;ická brána.